"Five," said White, answering the question after a fast finger count. "The first part is three interweaving times zones, the second is a separate time zone. So's the third." His inspiration to write the play was a dare: "I had a friend who challenged me to write this, and I resisted for a long time to write about the subject matter, but the more I delved into it, the more it felt really right. I tell people it's a very personal fiction. It's hard to describe what it's about without giving too much of it away. There is a mystery really at the heart of it in terms of how the structure unfolds." "It's still a little unbelievable," he confessed. "I didn't think it would ever really happen." 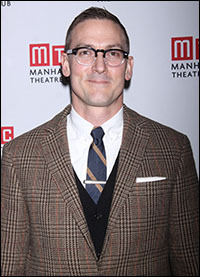 The play had its Off-Broadway world-premiere by Manhattan Class Company in March 2011 and it's now having a Broadway engagement by Manhattan Theatre Club — a gamut from MCC to MTC, both productions starring Metcalf and helmed by Joe Mantello. "I don't know who the rabbi was, but I'm going to convert," White said of the play's miraculous journey. Yes, he said to the obvious question, he does have a new play. "It's called The Snow Geese. It's about a family in upstate New York in 1917 who are really at the end of their resources. They were wealthy and they realize how little they've had and for how long they've had very little. It's a play about the end of The Gilded Age, about the disappearance of wealth and what do you do when you think you have so much and then you actually don't have anything at all and how that affects the family dynamic. Really, I think in an odd way, it's a play that mimics what has happened to us in this country now in the last couple of years." Manhattan Theatre Club, which could in good conscience trot out the slogan "Preserving the Best of Off-Broadway — on Broadway" after packing the Friedman with uptown stagings like Wit, Venus in Fur and Collected Stories, continues the trend with The Other Place, and Metcalf is a very willing accomplice. "I wanted more audience members to see the play," she said with a very believable altruism. Of course, this reprise gives her a good shot at awards (like, say, the Tony) that she didn't pick off her first time around. 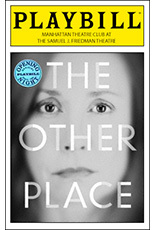 The performance won her an Obie Award as well as nominations for a Drama Desk Award and an Outer Critics Circle Award. And how did she spend her summer vacation, resting up between Juliana meltdowns? Disney World, perhaps? Hardly. She went to London to play the unhinged Mary Tyrone, opposite David Suchet, in Long Day's Journey Into Night. "They're all parts I just can't pass up," she shrugged helplessly. And no, a little Tyrone didn't creep into this performance. "I don't think I can find any overlap." One of the perks of this particular reprise is the chance to play scenes with Perry, who, from certain angles when the light is right, looks like she could be Metcalf's daughter. In point of fact, she is Metcalf's daughter. "We acted together a long time ago, in Chicago, when she was 15. It was play by Justin Tanner called Pot Mom." 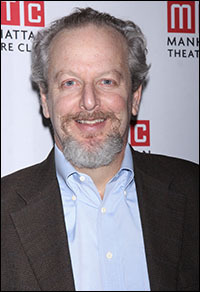 It was staged at Steppenwolf where Metcalf's then-husband, Jeff Perry, is a co-founder. Most recently, he appeared Off-Broadway as the father in Tribes. So what is it like having to share the stage with your mom at the same time you're trying to make your Broadway debut? "Really wonderful," Perry shot back succinctly. "I knew, going into this, what a beautiful performance she had crafted and what Joe Mantello had created the first time around and what Danny would bring to the play, so I thought it was just a really fun, freeing kind of experience." Stern, an old kid of 55 who is only now getting around to his Broadway debut, is a bit of a shock to find in such a heavy-duty dramatic role. "They saw 'Home Alone 2,' and said, 'Yeah, that's the guy I want,'" he jested. "I've done dramas before, believe it or not — when I was a kid doing theatre here. I lived here for about 12 years and did some really great dramatic parts — True West, for instance. Then, that comedy thing sorta took over in the movies, so it's fun for me to get back to all of that. I'm really not that funny or silly in my real life. Joe Mantello knows who I am. He called me to do the play. Then, I read it, and I was so flattered he thought of me. He knows I'm not funny and silly all the time, so it's good to get to show off this side of me." His role of Metcalf's long-suffering husband resembles Jim Broadbent's truly supporting and Oscar-winning performance, opposite Judi Dench's "Iris." "I'll try to catch it — I may steal some stuff from him," he cracked. Then, seriously: "I love this part. It's an important part in that he keeps on witnessing this loss. Between her and the production, you really get inside what that fracturing mind feels like. The other thing that happens with this disease is what it does to the people left standing." If the play has changed, Mantello said, it's because half the cast has changed. "It's different because the personalities and idiosyncrasies of Danny Stern and Zoe Perry alter the play in different ways. When you do a production, then do it again with another group of people, it takes on the personality of the group." The director reached back 15 years to find a replacement for Dennis Boutsikaris in the husband role. "Danny and I worked together years ago — the first season of the Bay Street Theatre in Sag Harbor. Robbie Baitz and Terrence McNally wrote a play called House about a house that was being sold. Richard Dreyfuss and Marsha Mason were the sellers, and Danny and Deb Monk were the buyers, and Rue McClanahan — rest her soul — was the real estate broker. It was a wonderful play." 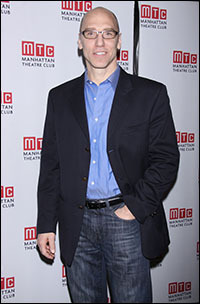 Mantello's next project could give Metcalf a run for the Tony. "I'm doing a play called I'll Eat You Last by John Logan about superagent Sue Mengers, starring Bette Midler. She hasn't been on Broadway in a long time. The last time she was on Broadway in a musical — excluding her three star vehicles — was Fiddler on the Roof [she was a replacement Tzeitel, 1964-1972]. I don't believe she's ever done a play." The fourth member of the four-person Other Place cast is a returnee, John Schiappa, in the role of Metcalf's son-in-law, Richard. "This is my second time around getting to watch Laurie Metcalf," he beamed. "I did it down at the Lucille Lortel for MCC before, and I can tell you Laurie Metcalf brings it to the theatre every performance." He doesn't detect any real difference in the two productions. "I would say that there's not a big change," he ventured. "Script-wise, nothing really changed, but the ability to get to work on a piece the second time around with such great talent and Joe Mantello at the helm, it just gets deeper and richer and better and fuller. I think that's what's been amazing, having the opportunity to approach this material again." On opening night, director Jack O'Brien was in attendance, along with his most recent Broadway star (the lovely, at-liberty Katie Holmes of the very Dead Accounts) and his next (Nathan Lane, The Nance as of April 15 at the Lyceum). Lane, it will be remembered, had Metcalf for his Tony-nominated speechwriter when he was President in the Mamet-written, Mantello-directed Oval Office antic, November. MCC's Robert LuPone and Bernard Telsey and MTC's Lynne Meadow and Barry Grove spent the evening, clucking contentedly over what they had wrought. Mario Cantone said he was plotting his Broadway comeback, but carefully this time: "I'm trying to get my next one-man show produced, hopefully for the fall. It's called Mario Cantone Swings Both Ways. I put my frigging name in the title, that's what I did because last time I didn't do that. I'm learning from Tyler Perry." Likewise in the fast lane, Megan Hilty: "I'm working on the series ['Smash'], I have an album coming out in March, and I'm going to be doing a concert in Carnegie Hall on March 8." To say nothing of the Gentlemen Prefer Blondes concert cast recording that's selling well. "I never had so much fun in my life," she said of that Encores! show. Other first-nighters: Brian d'Arcy James, late of Giant and now of concert gigs; Ari Graynor, late and great of The Performers; Richard Topol; Working lyricist Susan Birkenhead; Driving Miss Daisy author Alfred Uhry; Tony winners Adriane Lenox of Doubt and Ron Rifkin of Cabaret; Christopher Evan Welch, who butts heads with Philip Seymour Hoffman in "The Master" and regrets it; Stephen DeRosa, back from his West Side Story tour; actor-directors Walter Bobbie and Jerry Dixon; the super-busy Michael Wilson, who's helming Talley's Folly Off-Broadway and The Trip to Bountiful on Broadway this season; Jessica Hecht, checking out the theatre where she'll next play, opposite Judith Light, in The Assembled Parties; Daniel Breaker, who'll be breaking in a club act at 54 Below on Jan. 28, and his director-wife, Kate Whoriskey; actor-composer Seth Clayton with Channing Kehoe; comedienne Amy Sedaris with TV's Andy Cohen; Emmy winner Edie Falco, in from rehearsing MTC's next City Center offering, The Madrid, and that play's author, Liz Flahive; Actors' Equity Nick Wyman, looking properly Presidential; and that always classy acting couple, Robert Emmett Lunney and Jan Maxwell.